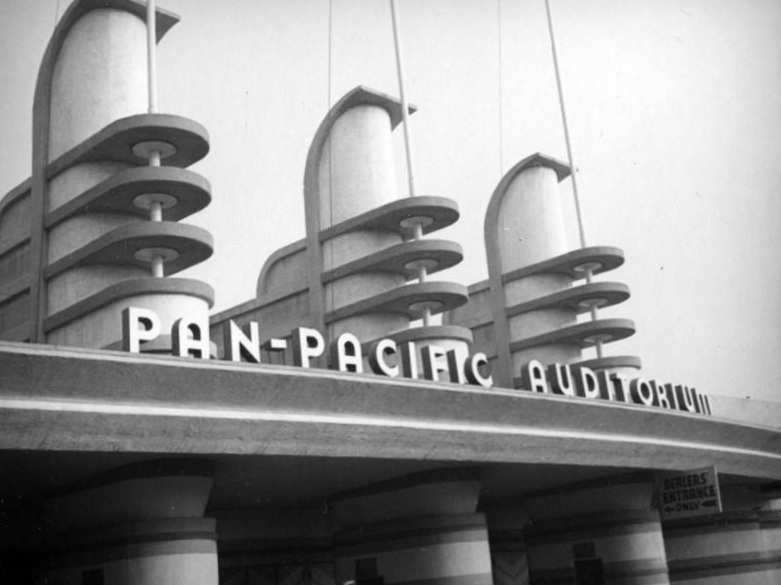 The Pan-Pacific Auditorium opened on May 18, 1935 in the Fairfax District as a stunning example of Steamline Moderne architecture, with its green and white facade and distinguishable fin like towers and flagpoles. Behind the entrance was a wooden auditorium that could hold 6000 guests. 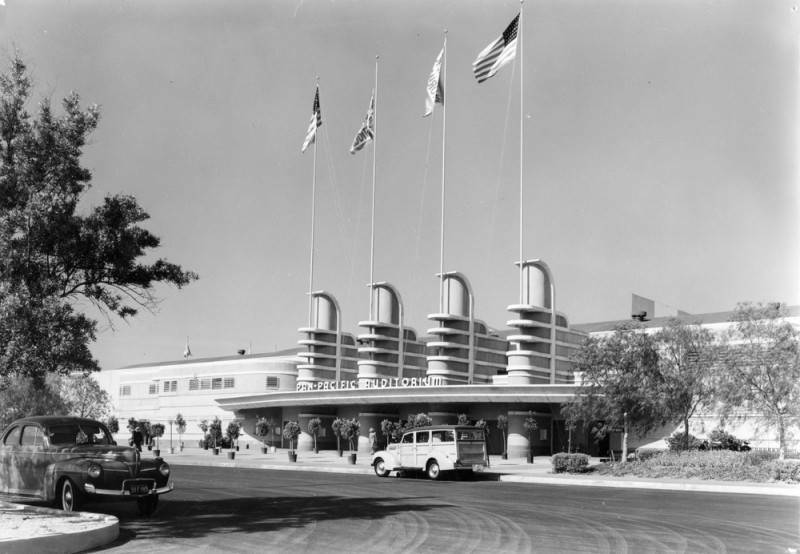 The building was commissioned by Phillip and Clifford W. Henderson with the intention of giving Los Angeles a public convention center "to accommodate the annual automobile show and a wide variety of cultural, recreational and sports events." 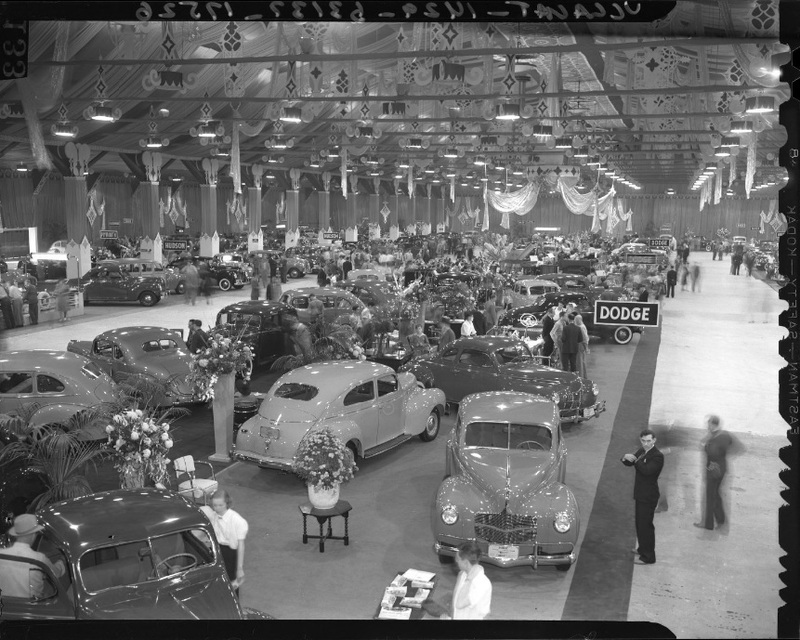 Auto Show in Pan-Pacific Auditorium. Photo from the LA Times via UCLA Library Collection (1939). For the next several decades, the Auditorium did just that, playing host to auto shows, the Ice Capades, political rallies, professional and collegiate sporting events, and concerts. Elvis Presley's first LA show was at the Auditorium, where he "wriggled" his way across the stage in 1957 to throngs of screaming fans. But when the much larger Los Angeles convention center opened in 1971, the Pan-Pacific Auditorium soon fell out of popularity. It closed its doors in 1972 and save for a few on-screen appearances, namely the 1980 film Xanadu, began a nearly 20 year period of decline and deterioration. The Auditorium was plagued with vandalism and failed development attempts, and despite a last-ditch effort by the LA Conservancy to fight to bring it back to life, it was completely destroyed by fire on May 24, 1989. Basketball game at Pan Pacific Auditorium. Image via LA Public Library (year unknown). 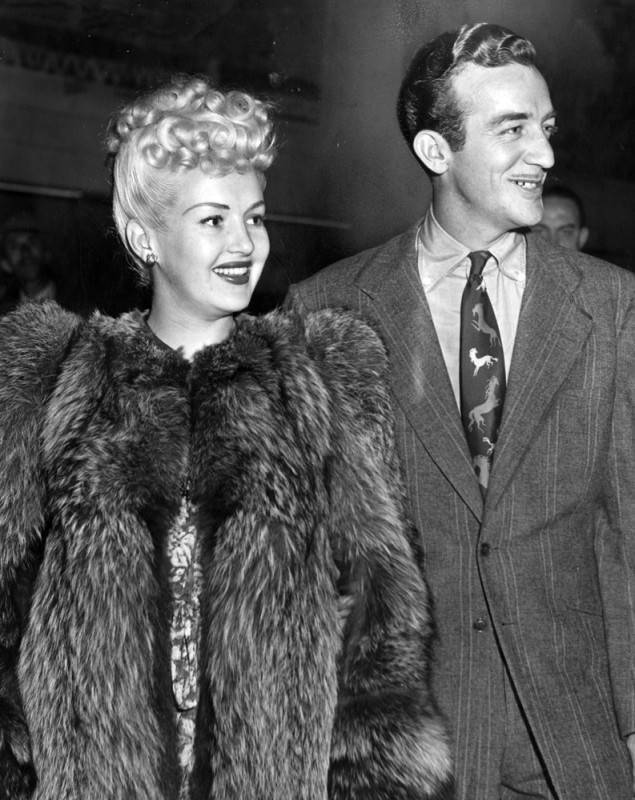 “Newlyweds Betty Grable and Harry James were among the stars of the entertainment world who were thrilled by the dazzling performances” of the Ice Follies at the Pan-Pacific Auditorium. Photo via LA Public Library, LA Herald Examiner Collection (Sept. 24, 1943). Fire that ultimately destroyed the Pan-Pacific Auditorium on May 24, 1989. Photo via the Los Angeles Fire Department Historical Archive. In 2002, a park and recreation center opened at the old site of the Pan-Pacific Auditorium, and the building pays homage to the architecture of its predecessor with a curved facade and scaled down replica of the Auditorium's fin like towers. And since 2011, an even more faithful recreation of the Auditorium now greets visitors as the entrance to Disney's California Adventure in Anaheim.